After a booze-fuelled jam session, Johnny Jones and his old band-mates from the once revered The Weapons of Happiness come up with a gem of a pop punk single. The problem is that no one is interested in resigning a bunch of aging rock stars. But Johnny's not one to quit easily. And he has a plan – a hoax that will reveal the sham that the music industry has become. In Sara Sugarman’s Vinyl, Phil Daniels (Quadrophenia) and Keith Allen (Trainspotting) return to the big screen, supported by a sensational young cast, with charismatic newcomer Jamie Blackley (Snow White and the Huntsman, London Boulevard) delivering a standout performance. Based on the story of Mike Peters’ true rock and roll hoax of 2004, Vinyl tells how a group of washed-up rockers hoodwinked top record labels, radio DJs, and the entire rock music world by releasing a pop punk single under a fictitious teenage band's name… now they just need to teach this rowdy bunch of kids what true punk spirit is all about. 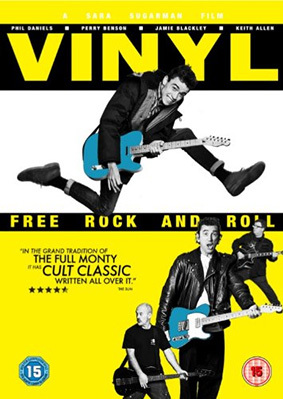 Described by Monty Python's Terry Jones as "Funny, surprising and subtle," Vinyl will be released on UK DVD on 1st July 2013 by Altive Media at a yet to be confirmed retail price.